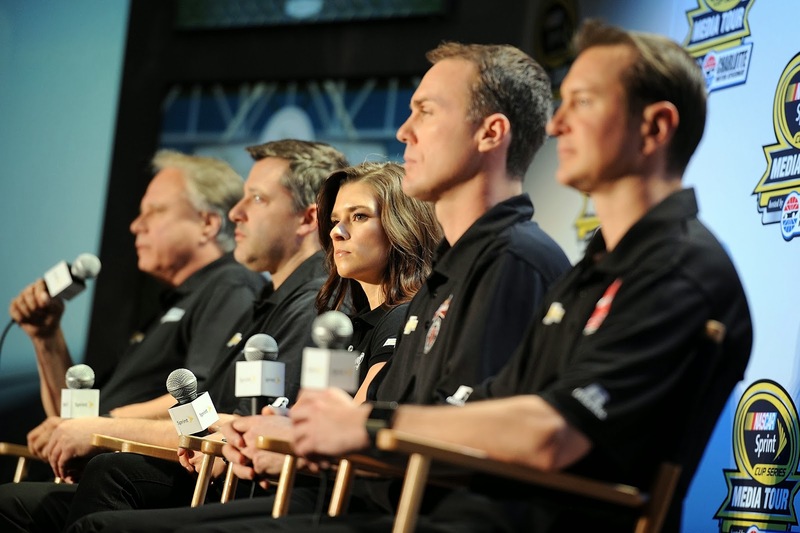 (L-R) Gene Haas, co-owner of Stewart-Haas Racing, Tony Stewart, co-owner of Stewart-Haas Racing and driver of the #14 Bass Pro Shops Chevrolet, Danica Patrick, driver of the #10 GoDaddy.com Chevrolet, Kevin Harvick, driver of the #4 Budweiser/Jimmy John's Chevrolet, and Kurt Busch, driver of the #41 Haas Racing Chevrolet, speak with the media during NASCAR Sprint Media Tour at Charlotte Convention Center on January 27, 2014 in Charlotte, N.C.
Stewart-Haas Racing operating as a four-car team in 2014 is significant news just from an operational standpoint. Add to that fact that joining Tony Stewart and Danica Patrick, now the second senior driver on the team, are fellow alpha personalities Kevin Harvick and Kurt Busch and you have the potential for a highly combustible race team, right? No, says driver/owner Stewart during the NASCAR Sprint Media Tour hosted by Charlotte Motor Speedway on Monday. "What everybody is overlooking is we have four alpha drivers. But we provide a great support system for each other because we understand each other. That’s what teams are about. It equals a huge positive for us and a great match that makes us a stronger team," Stewart says. "It’s really a dynamic that I haven’t seen and I think it’s a good fit. It’s hard to put four personalities that are that similar together, but it is working," Stewart continues. Patrick was asked a similar question during one-on-one interviews and told a story about how Kevin Harvick helped her find a faster, high line at Las Vegas Motor Speedway last season. "I feel like he'll (Harvick) be able to help me. I see this combination of drivers being a good thing. We all know and respect each other," she says. Busch and Harvick also are enthusiastic about the race team. Sounds good now, but we'll see what happens in 18 days when the season starts.